Are you getting serious about working with wood? Then, definitely, you need a good quality reliable table saw to get the job done without any hassle. You need to create intricate shapes for doing fine woodworking or creative DIY project. A jigsaw is a master of tools that useful in cutting complex shapes and detailed cut for the DIYers and carpenters. 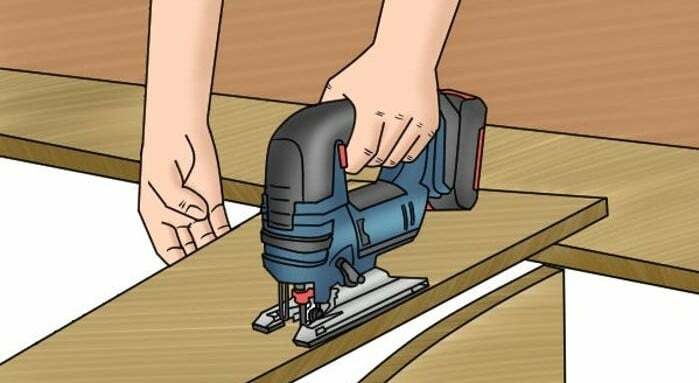 You can create beautiful curves and straight cut in woods or other materials such as aluminum, laminate.PVC, metal, and ceramics if you know how to use a jigsaw. This article will teach you how to use jigsaw correctly that will help you to use jigsaw all type of your projects. Are you constantly faced with the need to make round, straight and dipped cuts for your woodworking project? Or do you need to cut lots of different materials like wood, plaster, plastic, or metals? Then, you may find it important to invest in a versatile saw. In that case, you’d be at an overall better off position if you go for nothing but the best jigsaw for woodworking. 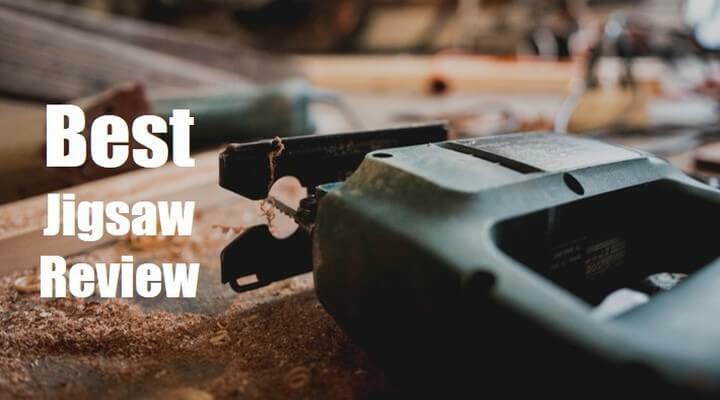 If you’re in the search for a great jigsaw, we’ve done the hard yards for you and finally found the top 7 most popular Jigsaw for woodworking. Read and pick the right one for you! 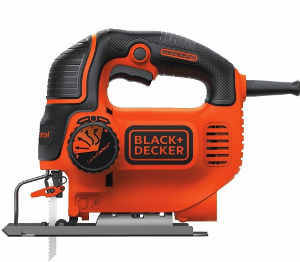 If you’re looking for the best cheap jigsaw to accomplish your small project, then this Smart Select Jig Saw from BLACK+DECKER is perfect for you. Compact and convenient, the BDEJS600C is an ideal jigsaw for a variety of cutting material around the house. Featuring 5 amp motor and up to 3,000 SPM of cutting power, this unit can cut through the wood laminate, PVC, aluminum and other metals. One of the great features of BDEJS600C is its curve control technology which means you can adjust the orbit in 1 to 4 customizable settings depending on your applications. What’s more, the speed adjustment switch and lockable trigger make it more convenient. Importantly, it accepts the U and T shank blade. Another nice aspect of this jigsaw is it comes with improved and new wire guard that offers a clear line of sight. Finally, the Keyless blade clamp is definitely a convenient and safe feature for tool-free blade change. Not only that, for dust collection, it has a vacuum hose attachment slot. When you want a versatile jigsaw saw at an affordable price to handle small projects around the home, this is the one to bring home. 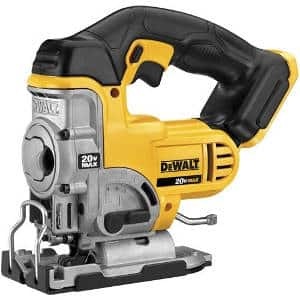 Here’s a solid jigsaw with great power from the popular brand Dewalt. And this time it’s DEWALT DCS331B, one of the best cordless jig saws available in the market todays. First of all, this DCS331B comes with a powerful motor which is even much more powerful than many corded versions of its class. It’s really awesome. Secondly, its variable speed trigger provides 3000 SPM. It’s also great and more convenient than it being a separate setting during cutting. Moreover, it provides versatility for easy bevel cutting. The all-metal, keyless shoe bevel offers 4-position orbital action for wood cutting. The anti-slip comfort grip of this unit also offers you increased control and comfort. And it also accepts T-shank blades for professional results and optimal holding power. Additionally, the lever-action keyless blade clamp designed to allow you to change the blade easily and quickly. Just as you’d expect DEWALT DCS331B features a removable shoe cover that will help to protect the working materials from scratches. This is not the end…. The adjustable dust blower is also a nice addition to help the users to see where they’re cutting. You can disable the function that directs the air down at the blade. So, no more constant blowing while cutting! Overall, DEWALT DCS331B is an easy to maneuver professional grade jigsaw that well worth the price. 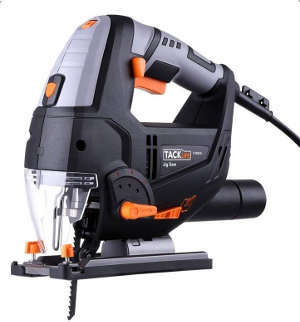 Here’s another affordable corded jigsaw from TACKLIFE that comes with some smart features including Laser & LED, pure copper motor and carrying case. Locking-speed switch, tool-free blade installation, low vibration, and 10feet cord makes this saw more convenient and more ergonomic. Although this model was designed for professionals, anyone can use it comfortably. The 6.7 amp pure copper motor can constantly rotate up to 3000 SPM which offers a 6 variable speed control. So, you can make a quick, accurate adjustment for cutting various materials such as plastic, steel plate, stainless steel, aluminum or wood. Again, A4 position orbital action allows you to cut straight, small-, medium- and a large cut to meet different cutting needs. Moreover, the built-in laser guide and LED light illuminates the cutting line and thus increases accuracy. The motor also produces less heat. So, it ensures efficient cuts, and extends product life. Additionally, the blade allows making bevel cuts up to 45 degrees in both rights and left directions. It also features a front air outlet that blows dust to prevent chip splatter and makes cutting safer. On the other hand, its rear air outlet, adsorb debris to enhance cutting performance. Finally, this unit comes with a nice carrying case, 6pcs jigsaw blades, dust exhaust pipe, and Allen wrench. Overall, this TACKLIFE jigsaw is excellent for both hobbyists and professionals. It will ensure that you achieve high-quality results with all of your DIY and woodworking projects. The case is annoyingly too small. 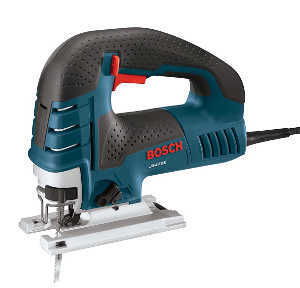 Bosch JS470E is one of the best-corded jigsaws under 200 on the market. This saw provides power, durability, and precision for any woodworking professionals or homeowners. The 7 Amp motor allows you to cut through wood, aluminum, and even steel. For angle cut, it has a bevel range up to 45 degrees. It also has the no-load stroke per minute ranges from 500 up to 3,100 that allow you to cut through wood up to 5-7/8-inches, 3/8-inch on mild steel and on aluminum up to 7/8-inch. Additionally, the low-vibration design and internal precision-machined plunging system enhance accuracy. What’s more, it also allows for the smooth operation in a variety of jobs. Of course, it has an ambidextrous lock-on button that offers you an extended and steady cut without compromising comfort. The shape is also quite ergonomic. Thanks to its tool-less blade-change system, accelerator trigger, and four orbital-action settings. The blade stops immediately when you stop the tool offering an excellent point of security level. It’s also worth noting that, this saw comes with the non-marring case, an anti-splintering insert, a blade and bevel wrench. In conclusion, Bosch JS470E rhymes with performance and efficiency. If you don’t comfort the top handle model, try Bosch Barrel-Grip JS470EB (Best barrel grip jigsaw) which has almost the same features. Next, we have this low profile design Top Handle Jig Saw from the renowned brand Makita. If you require handling the unit in compact areas, then this jigsaw is perfect that will offer improved handling. Moreover, the well-balanced design with 5.2-pound weight helps to reduce operator fatigue. Additionally, the 2-finger trigger and ergonomic rubberized grip increase user comfort. The 6.5-amp motor offers faster and more accurate cuts in a variety of materials. The 500 to 3100 SPM variable speed enables the users to match the speed according to their needs. And the die-cast aluminum base allows you to adjust the angle from 0° – 45° right or left. Not only that, there is an onboard wrench that helps you adjust the bevel quickly. Additionally, the tool-free blade change system is obviously a convenient feature for fast blade removal and installation. When it comes to dust management, this tool features a built-in dust blower with a vacuum that clears the line of cut for increased accuracy. Finally, it’s very well- constructed and durable. The die-cast aluminum housing base ensures its long service life. The Porter Cable PCC650 is an exceptional battery-powered jigsaw, especially at the given price point. 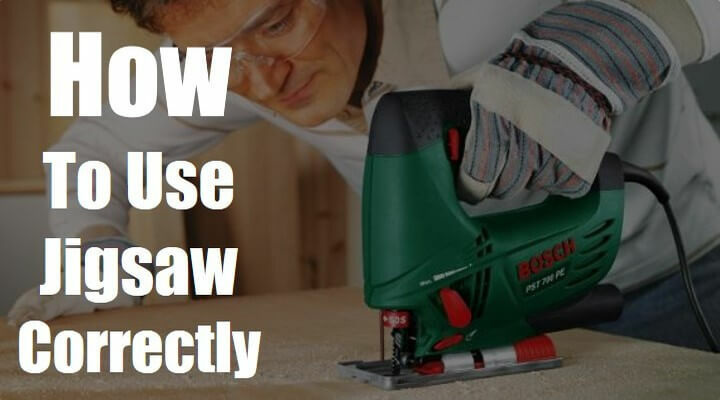 This cordless jigsaw is a part of the 20V Max System and can definitely be an attractive addition to your toolbox for those DIY projects or professional work. Firstly, the 3 orbital settings of this unit offer you the easy adjustability of the cut aggressiveness across a variety of materials. Secondly, the 0 to 2500 SPM variable speed trigger provides control for clean and accurate cuts. It also features a beveling shoe that allows you to cut 0 to 45- degree bevel cuts in wood based on your project needs. Moreover, it can cut up to 1.5-inch copper pipe. PCC650B offers you a tool-less blade changing system. So, you can quickly and easily change the blade when you need it. Of course, there is an integrated dust blower that clears debris and dust to increase cutting line visibility. Finally, this bad boy comes with a contoured over-molded handle that optimizes increased comfort. The addition of the 4-inch wood blade with the package makes the tool cost-effective. Obviously, you won’t go wrong with this PORTER CABLE PCC650B Bare Jigsaw. This SKIL 4495-02 Orbital Action Laser Jigsaw opens up with a wide range of applications. Designed for the high demands of carpenter, carpenter and other construction professionals, this saw offers increased precision and endurance. This Jigsaw is characterized by its power 6.0 Amp offering laser guide for accurate straight cuts. It features a power cable and a smooth, grippy handle. It reduces vibration for most stable use. Mainly, there is an improved blade clamping system for sharper sawing. 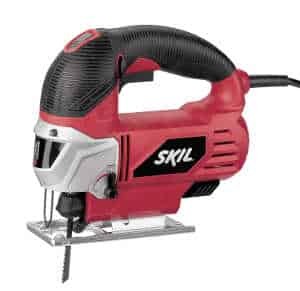 SKIL 4495-02 is known as a sturdy jigsaw. Thanks to its steel base that is resistant to deformation. It is equipped with a 4-position orbital cut control to ensure fast, flawless cuts. The Variable speed trigger works wonders by adapting the cutting rate to the worked material. Lastly, this reliable jigsaw provides excellent user comfort. Unusually quiet, sawing sessions become more enjoyable. Thanks to its Soft Grip coating surface and its small size, it is easy to maintain. Plus, it’s a simple saw to handle. In short, even at the entry level, this jigsaw will give the user all the comfort, performance and robustness. Generally, it is between 350 and 850 Watts. The higher power is more significant for the depth of cut. At 350 W, we speak of punctual DIY, low yield. At 850 W, a cutting depth of 100 mm in wood, 10 mm in steel and 30 mm in aluminum is expected with comfortable use. There are various types of jigsaw blade specific to the material to be cut and the type of cut. These include the wood blade, the inverted tooting wood blade, the coping blade, and the metal blade. Rounded cuts, miter cuts or skews can be made depending on the orientation of the jigsaw base. Weight depends on maneuverability. Know also that the more the jigsaw is massive, the more powerful it should be. It is necessary to stabilize the cutting speed, especially on fragile materials. Adapting the speed to the material allows obtaining an optimal result. This device allows bettering to evacuating the sawdust, to ensure more precision and to guarantee the longevity of the blade. Here, I tried to detail all for your need to know about the best jigsaw models. Essential tips: your choice always depends mainly on what you expect from your jigsaw, including the frequency of use and the materials to be cut. What are the Uses of a Jigsaw? A jigsaw can cut 10-millimeter steel plates or 30-millimeter thick aluminum plates equipped with the proper blade, If your project involves cutting metal plates in this range, then you can use a jigsaw. Indeed, for rough cutting of woods, they can be performed with a jigsaw. The maximum thickness of wood that can be cut with a jigsaw is 100 millimeters. For wood, the cuts are faster if you use a jigsaw. Jigsaws also allow the cutting of plastic and PVC, provided you use the correct blade of course. To cut the plastics, prefer the models that feature sparkle. And yes, even if there are already devices that are designed specifically for this purpose. Many DIY pros choose to use a jigsaw due to its versatility. Also, the fact that they are portable makes its use more comfortable. This is one of the significant benefits of using a jigsaw. If your project involves cutting agglomerated and plywood panels, cutting with a jigsaw is more practical and precise, just use a blade designed for that purpose. Indeed, you can make curved cuts with a jigsaw. These cuts are difficult to make or not precise on a band saw or rotary saw hence the great advantage of using a jigsaw. However, it is necessary to use a blade designed to sing if not the one you use will break quickly. Some of the work plan to do: wall cutting, closet embedding, etc. Working this jobs with a jigsaw is so compelling. If you plan to remake your parquet, make your cuts with a jigsaw. It is precise and easy quite to handle. Additionally, you do not need to deploy substantial effort thanks to its optimal center of gravity. There are still some works that can be done by jigsaw. : model making, model, palette, etc. However, the materials on the market are all different so the blade of your device should always be replaced when you change material. And for quick and easy use, I will advise you to choose a device whose blade is easy to mount, such as devices that offer a self-tightening blade attachment. Your choice always depends mainly on what you expect from your jigsaw. Before choosing a model, consider the frequency of use and the materials to be cut. Once you have a good understanding of your application, it’ll be easier to assess which best jigsaw for woodworking would work best for you. Take your DIY or professional woodworking projects to the next level with the help of any of the listed best jigsaw. All credit goes to, ToolWinner Blog team for their excellent gratitude in this article. We acknowledge for giving this support to us. 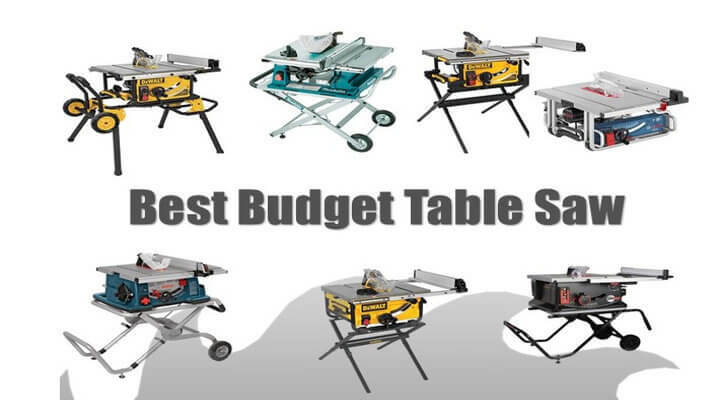 Obviously, You want to buy the best quality table saw. But your budget is fixed and don’t know which model will be good for you? Don’t panic; you are now in the right place where you discover everything about the table saw. We offer a guide that will allow making the right choice and At the end, also discuss buying guide and how to use a table saw. Know what? 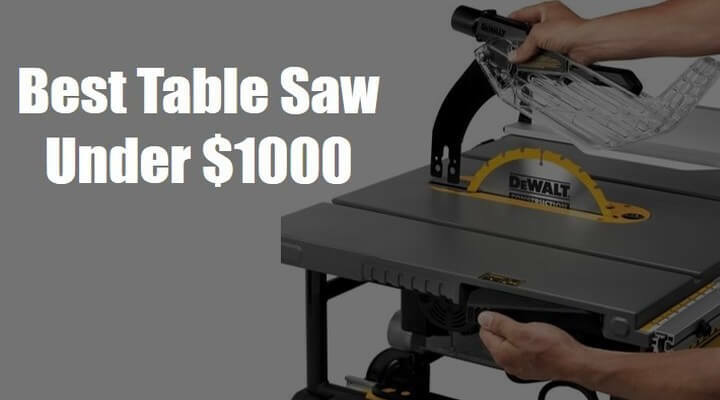 I have tested some flagship model of table saw under 500 and 600 bucks. And from that experience under the belt, I’m recommending you a few of the best table saw under 200 and 300 dollars.